The FMI-S30 is self-powered using a built-in solar cell with continuous re-charging even indoors. No batteries or AC-Adapter is ever required. Simply keep this device uncovered and exposed to ambient lighting and the internal battery will remain charged. Designed for use as a stand-alone handheld force measuring devise or used together with a mechanical or motorized test stand as part of complete force measuring system.The FMI-S30 is available in seven (7) different measuring ranges from 0-5 N (1 Lb, 500g) up to 0-5000 N (1000 Lbs 500Kg). It features a cast aluminum housing making it extremely rugged and suitable for use in the toughest production and laboratory environments with an overload protection up to 500%. The FMI-S30 includes user-set high and low limits, memory and USB output. 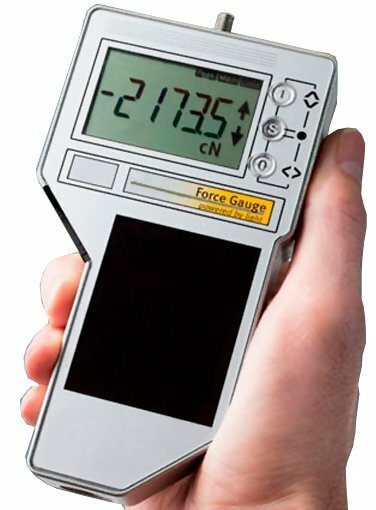 A large LCD Display shows the measured force value (Peak, or continuous) along with the unit of measure (Lbs, Kg or Newtons). It is supplied as a complete kit with various grip adapters including a chisel, flat head, hook, notched-head and shaft extension all supplied in a foam-fitted carrying case. Optional accessories include a Traceable Calibration Certificate.